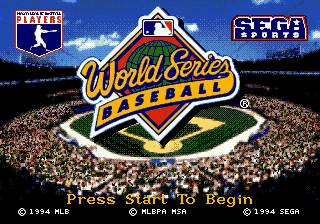 Sega Genesis Game published 25 years ago by SEGA of America, Inc.
World Series Baseball © 1994 Sega of America. All 28 Major League teams in the new six Division alignment. All 700 players, including your favorite stars! Many off-season free agent moves and trades are included. Sports Talk - new, improved play-by-play commentary. World Series Baseball was named 1994 Baseball Game of the Year (GameFan Magazine Vol. 3, Issue 1). A BLUESKY PRODUCTION IN SEGAVISION. Producers: Chris Smith, Jesse Taylor, Daniel Meade, Ken Balthaser Jr. SPEECH SYSTEM DEVELOPMENT BY WESTERN TECHNOLOGIES.